This is my friend, Scott. 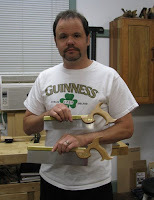 Scott is thrilled because his new Wenzloff saws arrived this week and he can’t wait to try them out. Trust me, he’s happy. Regardless of his mood, he always looks like someone just pilfered his lunch money. My partner and I find Scott’s grumpy disposition highly entertaining, along with his “gut-busting, lol, oh-my-God-did-I-just-snort?” stories about how gay guys hit on him all the time and he can’t figure out why. Scott is 100% straight. And we’re bringing him with us to the Woodworking in America conference in Berea, KY this November. He loves hand tools so much he might even crack a smile. I’ll have the camera ready. Scott and I decided to conduct and in-depth, painstakingly-scientific study comparing the smaller of his two saws with my Lie-Nielsen dovetail saw. Both are 9” long, 15 tpi blades. We liked both saws and the shape of the teeth looked identical to our untrained eyes, but Scott preferred his Wenz loff and I preferred my Lie-Nielsen. Since I usually cut thin, delicate dovetails, the Lie-Nielsen works better for me. I also feel like I have more control over the saw because it cuts less aggressively and has a smoother start. However, both handles were comfortable and both saws cut straight lines. 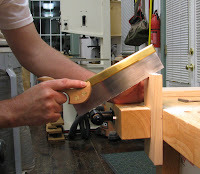 Scott preferred the more aggressive cut and heavier weight of his Wenzloff saw. He also preferred the feel of the handle over the Lie-Nielsen, stating that it felt handmade rather than machined. Scott has a different sawing technique than I do when cutting dovetails. His is actually the “right” way to do it where you start the cut at an angle and slowly level it out. I start with the saw completely level with the board’s edge to ensure I’m cutting exactly along my pencil line. One unexpected benefit to practicing sawing with a friend is that you can help each other improve your technique. By observing at board’s eye view from the side, you can tell if the sawyer is making a level cut and is using the entire width of the blade. In conclusion: Lie-Nielsen and Wenzloff are both great saws!